All the goodness of chocolate chip cookies made easy in one big batch of bars. Top with Valentine's, Easter or Christmas colored M&M's for a special holiday cookie recipe. I rarely make cookies. It’s not because I don’t love them, it’s because I don’t usually have time to sit around waiting for 3-4 batches to cook. Which is one of the reasons I love no-bake cookies so much (you just scoop them all out at once). I very recently (painfully and reluctantly) turned down an amazing (unbelievably huge, once-in-a-lifetime, life-altering) opportunity because I just couldn't make it work around my family’s busy (chaotic, crazy, wouldn't-have-it-any-other-way) schedule. But I’m supposed to scratch out 2 hours to bake cookies? So THIS is how I make chocolate chip cookies! Throw all the batter in a pan and go for broke! I usually cut these into 24 bars but you can totally go smaller. 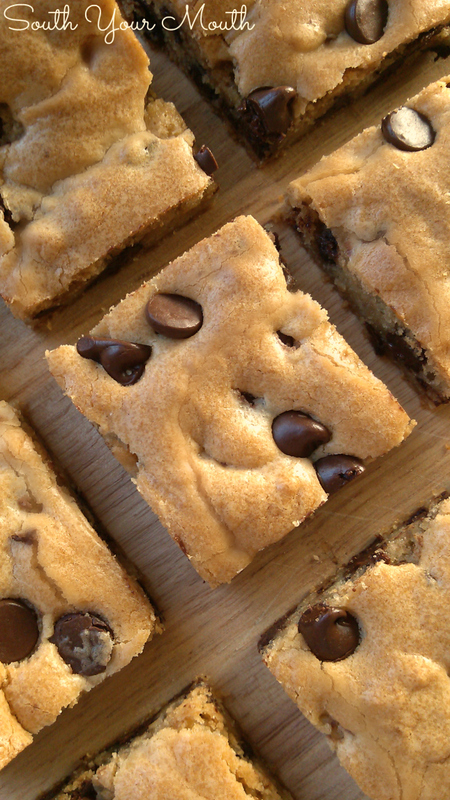 These remind me of blondies because they’re so chewy and moist! If you’re looking for Valentine’s, Christmas or any other themed cookies, just throw a handful of seasonal M&Ms on top before baking and you’re golden! Line a 13x9 baking pan with aluminum foil then spray lightly with cooking spray; set aside. Preheat oven to 350 degrees. Combine butter and sugars in a stand mixer or large bowl and mix with an electric mixer until combined and smooth. Mix in eggs and vanilla until well combined. Add flour and mix on low speed until combined. Stir in all but a handful of chips (about 3 tablespoons). Fold dough into prepared pan. Spread dough evenly into pan then sprinkle reserved chocolate chips on top of dough. Bake at 350 degrees for 25-30 minutes or until light golden brown around the edges. 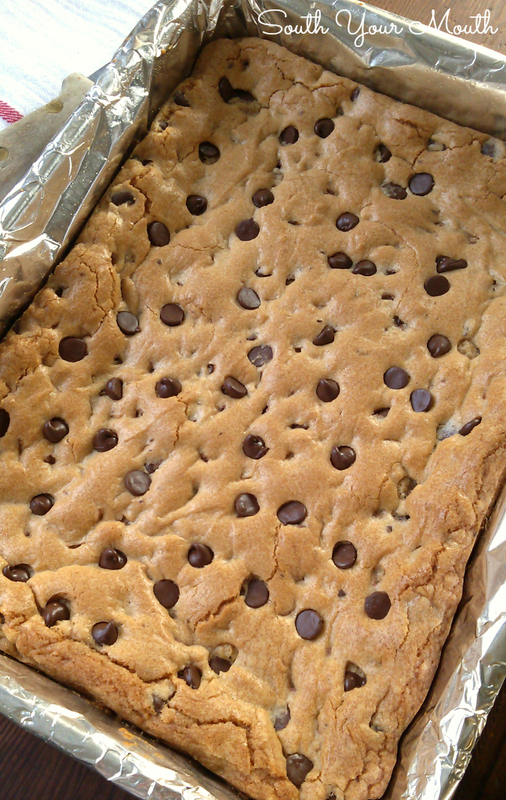 Once cool, lift up on the aluminum foil to remove the cookie slab from the pan. Cut into 24 bars and store in an air-tight container. If you don’t have any SR flour, just combine a scant 2 1/4 cups all-purpose flour with 1 teaspoon salt and 1 tablespoon baking powder. You don’t have to fool with reserving the handful of chocolate chips to sprinkle on top; it’s just a little trick food bloggers and food stylists use for swanky chippage. Otherwise, all the chips are mixed in the batter and you don’t really see them much. If you’re using M&Ms like I mentioned above, skip this step all together and sprinkle M&Ms on top instead. WOW...my hubby was just asking for chocolate chip cookies last night, this sounds so good and quick... guess what I'm making this afternoon ! I am totally, totally making these.............! I made these today and they turned out just wonderfully! I had to follow the instructions for making my own self-rising flour and it worked just fine. I also used parchment paper vs. the foil so I didn't have to spray with non-stick spray. Thanks for a great recipe! could you use bisquick instead of self rising flour? Errr..... maybe. It has a leavening agent but it also has shortening. If you try it, let us know! I just made these for an Easter family gathering. I followed the directions, (using the flour, baking powder, salt substitute), baked for the full time and it came out golden and perfect. Even the edges were perfect, not hard and overdone. Sure, give it a shot! These are fantastic, delicious and so quick & easy to make. I'm making it for the 2nd time in as many weeks at my DH's request. They don't last long. Thanks for sharing!! Just a suggestion, The tablespoon of baking powder is a little much it. You might want to say a teaspoon. Not too much at all. I use these quantities all the time and they work perfectly! Made this for a co-worker's birthday and decorated it like a cookie cake. I made 1 1/2 recipes of this because I used my sheet pan. It was a hit. 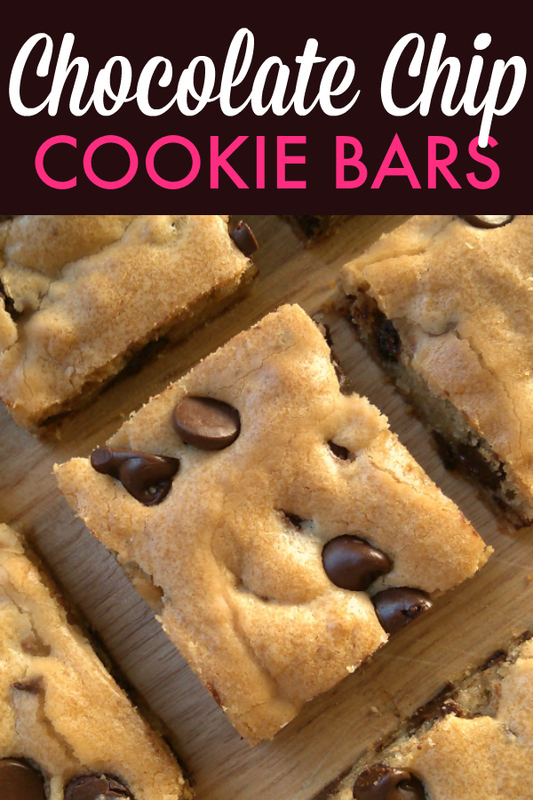 Love, love, love these cookie bars!! I make them all the time and they disappear very quickly. I've tried them with all semisweet chips, half semisweet and milk chocolate and half semisweet and half peanut butter chips and they are all delicious. It's a keeper! I am so glad you're enjoying them! Time for me to make again! First off I have to say this is the best recipe ever, the cookies are so soft and buttery. Have you ever added peanut butter to this great recipe? If so how much would you add? Then I use peanut butter chips. 2 great recipes yum. You are an exceptional cook. Thanks you so much. Well, I am glad you like them!! I've never added peanut butter but it's worth trying! Maybe add 1/2 cup and see what happens. I bet butterscotch chips would be good too!